In a world of omnipresent screens, it can be easy to forget the simple pleasure of curling up with a good book. In fact, a HuffPost/YouGov poll of 1,000 U.S. adults found that 28 percent hadn't read one at all in the past year. But the truth is that reading books can be more than entertainment or a high school English assignment. A study released earlier this month suggests that enjoying literature might help strengthen your "mind-reading" abilities. The research, published in the journal Science, showed that reading literary works (though, interestingly, not popular fiction) cultivates a skill known as "theory of mind," which NPR describes as the "ability to 'read' the thoughts and feelings of others." 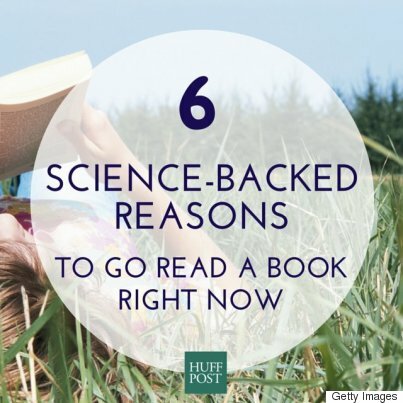 And that's hardly the only way being a bookworm can boost your mind and well-being. Below, six more science-backed reasons to swap the remote for a novel. Reading can chill you out. Stressed out? Pick up a paperback. Research conducted in 2009 at the University of Sussex showed that reading was the most effective way to overcome stress, beating out old favorites such as listening to music, enjoying a cup of tea or coffee and even taking a walk, The Telegraph reported when the findings were released. Measured by evaluating heart rate and muscle tension, it took the study participants just six minutes to relax once they started turning pages. "It really doesn't matter what book you read, by losing yourself in a thoroughly engrossing book you can escape from the worries and stresses of the everyday world and spend a while exploring the domain of the author's imagination," study researcher Dr. David Lewis told The Telegraph. It could help keep your brain sharp. A lifetime of reading might just help keep your brain in shape when you reach old age, according to research published in the online issue of the journal Neurology. The study, which included 294 participants who died at an average age of 89, found that those who engaged in mentally stimulating activities, such as reading, earlier and later on in life experienced slower memory decline compared to those who didn't. In particular, people who exercised their minds later in life had a 32 percent lower rate of mental decline compared to their peers with average mental activity. The rate of decline amongst those with infrequent mental activity, on the other hand, was 48 percent faster than the average group. "Our study suggests that exercising your brain by taking part in activities such as these across a person's lifetime, from childhood through old age, is important for brain health in old age," study author Robert. S. Wilson of the Rush University Medical Center in Chicago said in a statement. "Based on this, we shouldn't underestimate the effects of everyday activities, such as reading and writing, on our children, ourselves and our parents or grandparents." And it might even stave off Alzheimer's disease. According to research published in the journal Proceedings of the National Academy of Sciences in 2001, adults who engage in hobbies that involve the brain, like reading or puzzles, are less likely to have Alzheimer's disease, USA Today reported at the time. However, the researchers identified only an association, not a cause-and-effect relationship: "These findings may be because inactivity is a risk factor for the disease or because inactivity is a reflection of very early subclinical effects of the disease, or both," they wrote in the study. "The brain is an organ just like every other organ in the body. It ages in regard to how it is used," lead author Dr. Robert P. Friedland told USA Today. "Just as physical activity strengthens the heart, muscles and bones, intellectual activity strengthens the brain against disease." Reading may help you sleep better. Many sleep experts recommend establishing a regular de-stressing routine before bed to calm your mind and cue your body up for shut-eye -- and reading can be a great way to do so (as long as the book isn't a page-turner that'll keep you up all night). Bright lights, including those from electronic devices, signal to the brain that it's time to wake up, meaning reading your book under a dim light is a better bedside bet than a laptop. Getting lost in a good book could also make you more empathetic. According to a study published in the journal PLOS ONE, losing yourself in a work of fiction might actually increase your empathy. Researchers in the Netherlands designed two experiments that showed that people who were "emotionally transported" by a work of fiction experienced boosts in empathy. "In two experimental studies, we were able to show that self-reported empathic skills significantly changed over the course of one week for readers of a fictional story by fiction authors Arthur Conan Doyle or José Saramago," they wrote in the findings. "More specifically, highly transported readers of Doyle became more empathic, while non-transported readers of both Doyle and Saramago became less empathic." So go ahead, let yourself get caught up in a particularly compelling story, or swept away by a powerful character -- it's good for you! Self-help books, on the other hand, can ease depression. Self-help books may really help you help yourself. A study published in the journal PLOS ONE showed that reading self-help books (also called "bibliotherapy"), combined with support sessions on how to use them, was linked with lower levels of depression after a year compared to patients who received typical treatments. "We found this had a really significant clinical impact and the findings are very encouraging," study author Christopher Williams of the University of Glasgow told the BBC. "Depression saps people's motivation and makes it hard to believe change is possible." Self-help books may even work in cases of severe depression. According to a University of Manchester meta-analysis published in 2013, people with severe depression can benefit from "low-intensity interventions," including self-help books and interactive websites, as much or more than those who are less severely depressed.